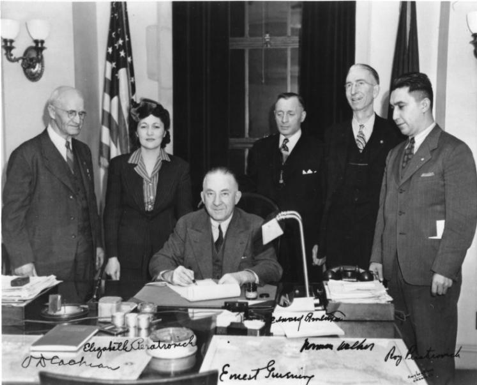 Elizabeth Peratrovich at the signing of the Anti-Discrimination Act of 1945. In 1989, Alaska officially recognized February 16thas the day to honor her. As an advocate who has long been influenced by the work of the women around me, I was very happy at the outcomes of this recent election and I was reminded of an early social justice activist that was doing this work long before it was called social justice, but instead civil rights. Her name was Elizabeth Peratrovich (Tlingit) and in 1945, 14 years before Alaska became a state, she advocated on behalf of Alaska Native People to the then territorial government to address Human Rights abuses in the territory leading to the Anti-Discrimination Act of 1945 to be signed into law, the first bill of its kind in the country. Alaska observes Elizabeth Peratrovich day on February 16thevery year. During this month of remembering other great civil rights leaders, I also enjoy reflecting on the influence that she was able to garner through her platform as the Grand Camp President of the Alaska Native Sisterhood. She was an amazing speaker. Peratrovich said many memorable lines during her debate with the acting territorial government at that time including, “…asking you to give me equal rights implies that they are yours to give. Instead, I must demand that you stop trying to deny me the rights all people deserve.” Much of her address was centered on reminding the men of that government that all indigenous people are human and deserving of humanity. It is encouraging to know that this message has not stopped. This recent election was a huge win for the representation of women across the country. With the Congressional elections of Deb Haaland from New Mexico and Sharice Davids from Kansas, many tribal organizations and Indigenous women are pleased with the long-awaited representations needed in Congress of Native People and the laws that effect what is termed by the government as Indian Country. Some of the issues that are gaining momentum and that are being examined at this time are Savannah’s Act, the reauthorization of VAWA (the Violence Against Women’s Act), and creating a Federally backed Database of Missing and Murdered Indigenous Women. All of these issues are platformed to create and maintain supports in Indian Country to address the levels of violence and discrimination that are experienced by our relatives nationwide and that many activists have been pushing for as acts of social justice. As advocates and concerned citizens, we can help by strengthening social knowledge on these subjects and by keeping these issues visible. Representation, visibility, and commitment have long been paramount to advocating for change. Let’s keep the momentum of justice and healing going! Gunalchéesh haa éet yidasheeyí.